We feel that as a registered breeder we have a responsibility to raise the most profitable cattle that we can for the commercial cattle industry. We believe that profitability starts with fertility. We weighed our cows after weaning last year, and our 4 year and older cows averaged 1156 lbs and 96% of them were bred. The next most important trait for us is calving ease. We have found that calves that die at birth do not have very good weaning weights! Once that live calf is on the ground we want it to grow rapidly and efficiently. 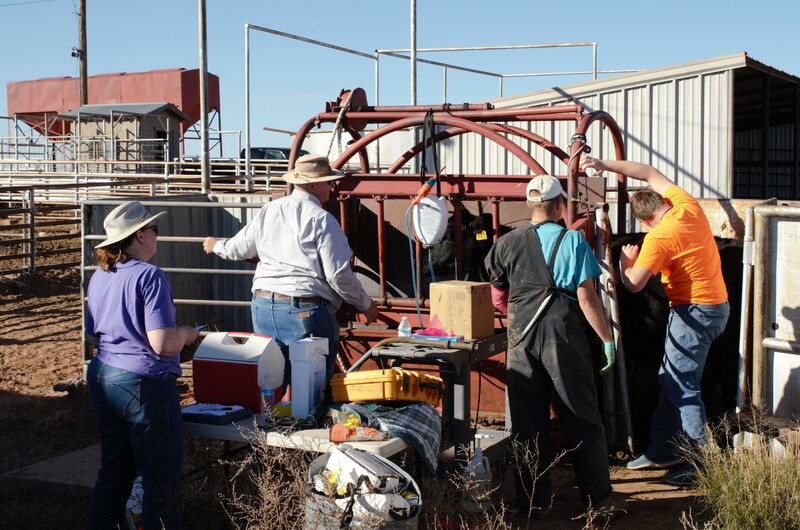 We have been performance testing bulls at the NMSU Tucumcari bull test for over 30 years. It was often a humbling experience as we competed against other breeders. We have focused on rapid growth genetics (High Yearling EPD) without sacrificing calving ease (Low BW EPD) since 1980. There are a lot of folks claiming to have efficient cattle. But, we all know you can’t select for a trait if you don’t actually measure it. 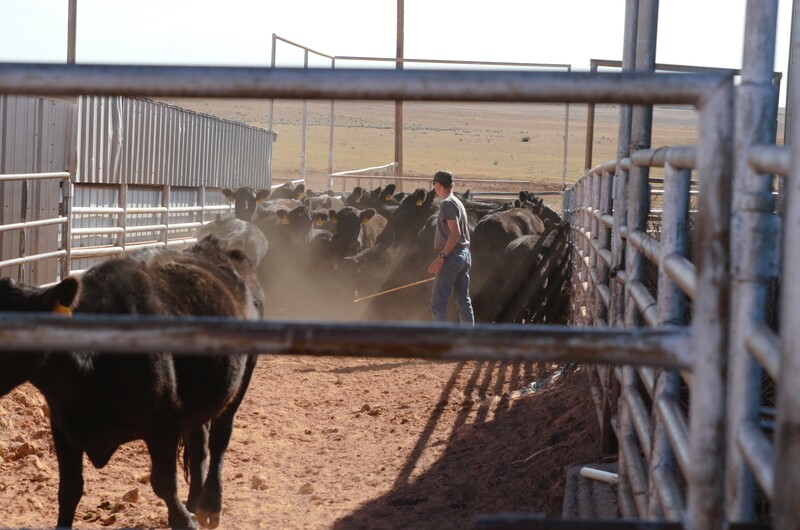 We are excited to be a part of the progressive breeders who have invested in a Grow Safe system at the Tucumcari Bull Test to individually test cattle for feed efficiency. It has been amazing to see the differences in feed conversion, with some bulls converting less than 4 lbs of feed per lb of gain and some converting over 9. Research has shown that young bulls tested for feed intake and RFI will have a genetic correlation of .90 for the same genetic improvement in the daughters retained for in herd use. Research has shown that the most efficient 1/3 of cows in your herd will consume up to 20% less forage than the least efficient 1/3 of cows in your herd. Size doesn’t matter – just because a cow is small or fat doesn’t mean she is efficient in her feed utilization, it just means she’s small or fat. In 1985 our pen of bulls at Tucumcari gained 3.25 lbs per day and converted 8.28 lbs of feed per lb of gain. Our pen in 2003 gained 4.91 lbs per day and converted 5.55 lbs of feed per lb of gain. In 2016 we had 6 bulls that have been tested at Tucumcari utilizing the GrowSafe system to measure individual bull feed conversion, and they averaged converting 4.90 lbs of feed per lb of gain! Now that's progress! Performance testing bulls every year will make you a believer in EPDs! Once these calves grow out, they need to provide value for both the packer and the consumer with high quality carcass characteristics. for the benefit of the industry, and the females kept as replacements need to be moderate sized, efficient converters of grass to produce adequate milk to raise heavy, soggy calves and breed back every year.  This is why J-C Angus is utilizing bloodlines that excel in the traits of Fertility, Calving Ease, Rapid Growth, Feed Efficiency, and Carcass Quality. We strive to do everything we can to improve our genetics and want our buyers to have confidence that our bulls come from the Southwest and have adapted and been selected for over 30 years to perform in our tough environment at 6,500 feet elevation. 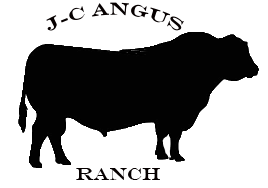 Our bulls have been developed on a high roughage diet designed to produce healthy bulls that are not over conditioned and that can adjust quickly to grass. They have been vaccinated at branding and at weaning with Bovishield Gold as well as a 7-way with Somnus and are also treated at weaning with a generic Ivermectin. They have been weighed by scale at birth, weaning and yearling. Many of our bulls have been performance tested against other breeders/bulls in an unbiased third party gain/efficiency test, measured for feed efficiency within sire groups/pens and individually, ultrasound measured for carcass quality, fertility tested, PiBVD tested, trich tested and are READY TO WORK! We pray that our cattle work as well for you as they have for us, and we greatly appreciate and thank past buyers who have invested in J-C Angus genetics. Stop by and see us anytime! We are located seven miles east of Moriarty, NM on exit 203 north of I-40. Feel free to contact us anytime at 505-832-9364! We look forward to seeing you soon!